Each card in a Tarot deck is assigned to one of the four prime elements: fire, water, air and earth. We can find these components all around us and even within us. Humans consist of fire (body temperature), water (fluids), air (breath) and earth (skin, bones, hair). In ancient times, alchemists and philosophers put great emphasis on the necessity to keep these four elements well balanced within the human body, so it can function properly and develop a healthy spirit (the fifth element). When we start to get to know the four elements in more detail, we can focus on creating a well-balanced mix in all aspects of our lives to create harmony. Let's take a look at the task of marketing. By adding some esoteric knowledge to marketing, we can make it magickal. If you are working in a Marketing department of a company, or you are promoting your own business, you will achieve better results by applying a well-balanced mix of the four elements to your campaign. 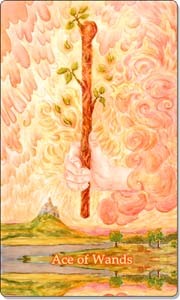 Fire is the life giving element, and in Tarot it is assigned to the suit of Wands. The spark, idea, inspiration, ambition, drive and urge; to imagine and create. When you market yourself or a product/service, the fire element helps you in your creative work and provides you with the drive and enthusiasm to initiate and sustain action. At this stage you start imagining how you would want this campaign to look and feel. You come up with ideas of artistic work (logos, images, banners), slogans, brand image, types of campaigns, marketing materials etc. that will attract attention from your potential customers. Let your creative imagination run wild. Try out different styles and angles to see what works best to achieve the results you want. Be innovative; create something unique rather than imitating others. Water is the element of feelings and emotions. 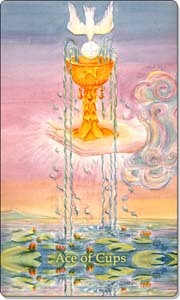 In Tarot it is assigned to the suit of Cups. With the water element you are putting your heart and soul into the campaign. If you are not convinced of your abilities or the product you are trying to sell, then your marketing efforts may not work out. Water is helping you to get emotionally involved with your business, product and service. It is important you can relate to your product / brand / service on an emotional level, you can identify with it, and it reflects your personality. At this stage you start engaging with your target audience to demonstrate benefits and advantages of your product and how it can help them or give them what they need. Be authentic. Love the work you do and the gifts you have to offer to the world. Connect and engage with your potential customers on an emotional level. Build relationships that are mutually beneficial. Tune in, listen and care. Air is the element of logic, reason, intellect and communication. 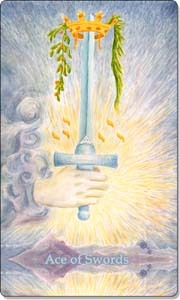 In Tarot it is assigned to the suit of Swords. With air you evaluate your campaign and fine-tune it. You also look at possible obstacles or risks that stop your customers making a purchase. Air helps you to focus on clarity, offer reassurances by providing as much information as you can, guarantees, testimonials etc., and develop new strategies with specific goals. Air also assists with managing and resolving conflict and pitfalls. At this stage you focus on knowledge and problem-solving to convince your potential customers that your product or service is right for them and will satisfy their needs. Provide free knowledge and information for your target audience to generate trust in your abilities. Focus on building a reputation as an authority in your field of work. Offer product samples and aim to identify and remove any obstacles that could stop a purchase. 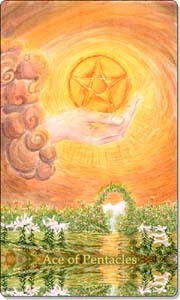 Earth is the grounding element; in the Tarot it is associated with the suit of Pentacles. With the earth element you create stability, permanence and sustainability. At this stage, your campaign starts to pay off, and you can build on that. Now that your target audience is aware of your product / service / brand and feel comfortable with it, they are prepared to take action and buy. Good news, but you have to be persistent and continue with your campaign until you have reached a level, which generates a regular stream of customers, and this may take a while. Don't give up after initial success. You need to be persistent and put effort into your campaign on a regular basis. Posting one advert / social media message / promotion isn't enough; you need to get your message out there continuously. Your customers aren't always ready to buy when they see your messages. Keep going, and one day they will. Now is also a good time to set a realistic marketing budget to sustain your campaign and generate more sales. Please note that you have to apply a mix of the above elements to your campaign rather than focusing on each one at a time. But of course, you will notice that sometimes you need a little more fire than water, or a little more air than earth - this is where it becomes magickal! Get the mix right, and you create harmony. Mix this traditional concept with a little woo-woo elemental Magick, and you will become more aware of the spiritual aspect of your work and its connection with natural cycles and energies, making it more holistic. And once you include your soul and spirit in your work, you will start to become more successful. Excellent advice! I appreciate your sharing this. What deck is this, please? The images are stunning! Tarot for Business by Christiane Hayes is licensed under a Creative Commons Attribution-NonCommercial 4.0 International License. "The secret to happiness in your work is to find a job in which your neurosis is constructive." © Christiane Hayes 2013 - 2017. All Rights reserved. Ethereal theme. Theme images by enjoynz. Powered by Blogger.